These days, it’s hard to offer a fresh perspective on the Dollar. The factors driving its short-term momentum – namely low interest rates and its perception as a financial safe haven – have been in place for nearly a year. It’s long-term prognosis, meanwhile, also hasn’t changed much. Since the beginning of the decade, the Greenback has been in a state of perennial decline as a result of its twin deficits and the related notion that it will be soon be replaced as the world’s pre-eminent currency. Since the last time I posted about the Dollar (October 6: Dollar’s Role as Reserve Currency in Jeopardy), then, there haven’t been many developments. Fears that oil will one day be priced and settled in an alternative currency – such as the Euro – continue to reverberate through the markets. Several ministers from OPEC countries have already officially dismissed such claims as baseless. A parallel debate is now taking place on the sidelines as to whether or not such a shift even matters. Unfortunately, Baker’s “simple arithmetic” is both erroneous and slightly irrelevant. Assuming a price of only $100 per barrel (pretty conservative if you believe the notion of peak oil), current consumption of 85 million barrels per day implies a daily turnover of $8.5 Billion per day, or $3+ Trillion per year. If the price doubles to $200 per barrel….well, you get the point. Taking this line of reasoning further becomes somewhat problematic, however. First of all, while OPEC members currently hold the majority (70%+) of there reserves in Dollar-denominated assets, it’s unclear how this would change in the event that oil was no longer priced in Dollars. It’s conceivable that just as many of these Central Banks currently diversify their Dollar-denominated proceeds into other currencies, that they would “diversify” Euro-denominated proceeds back into the Dollar. Of course, it’s also conceivable that a combination of inertia and investment strategy would cause them to hold a larger portion of there reserves in Euros. If OPEC Central banks continue to prefer Dollars, than Baker is right in arguing that the currency in which oil is priced has no implications outside of accounting. If, on the other hand, he is wrong, and a change in pricing causes/coincides with changing preferences, then the implications for the Dollar would be disastrous. 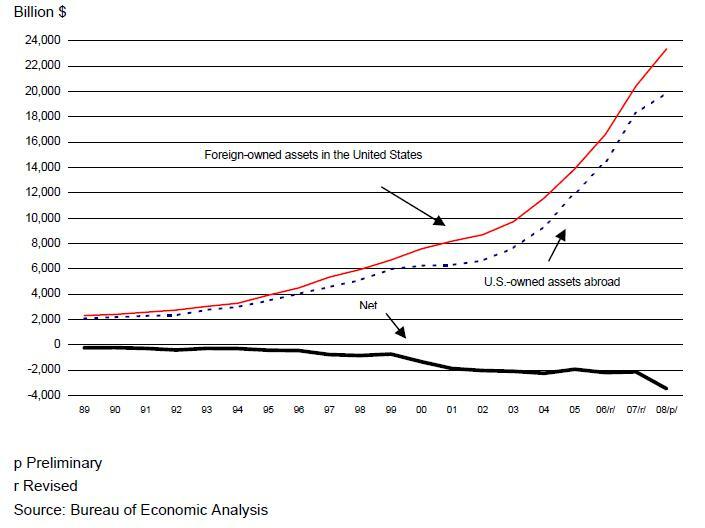 [Consider that $3 Trillion/per year which is at stake currently represents more than 15% of total foreign ownership of US assets.] The problem is that we just don’t know. What else is new? The US budget deficit came in at $1.4 Trillion for the fiscal year, the highest level since World War II. On the bright side, the deficit was $200-400 Billion less than earlier estimates. Meanwhile, members of the Federal Reserve’s Board of Governors restated the unlikelihood of higher rates in the immediate future. “Richard Fisher, president of the Dallas Fed and thought to be a rare hawk on the Fed’s Open Market Committee, chimed in that no one at the Fed thinks this is the time to raise interest rates.” Finally, the US trade deficit is once again narrowing, due in no small part to the declining Dollar. At this point, it seems reasonable to assume that much of the bad news has already been priced into the Dollar. Sure, the Australian rate hikes came as a surprise and forced many to rethink their calculations. Investors have already begun to separate the healthy currencies from the sick (to borrow an analogy from a previous post), but that the Dollar would be grouped with the “sick” currencies has long been anticipated. Given that the currency has already fallen by double digits in 2009 and is nearing the record lows of 2008, some are wondering how long it can continue. A good analogy of where the dollar is heading. Like you I agree the buck is going to be there for a long time. It is too risky to start making changes now. You’re right, but there is opportunity for buying $$$ and leave it few months, maybe a year?